Hab einen für mich neuen Challenge-Blog entdeckt: Sketch and Stash Challenge Blog. Da geht es darum, für einen Sketch neue oder lange nicht benutze Dinge zu benutzen. Das habe ich getan. Also: den Abdruck habe ich am WE erst bekommen, das breite rote Band lag schon lange in meiner Bänderkiste und die kleinen roten Teilchen in den Ecken hab ich auch neu. I found a new Challenge Blog ...new for me: Sketch and Stash Challenge Blog. There you should use some new or long time not uses staff for a sketch. I tried it out today for the 1st time. Well: I've got that image just last weekend, the red ribbon is not new, but I never used it before for anything and the little red things in the corners are new as well. 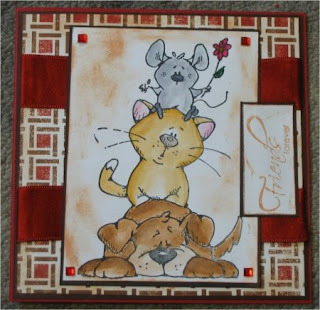 What a cute card Heide, I just love this image! Thank you for joining in our challenge. Ooooh ... die ist ja superniedlich!!! Oh what a cute image and I'm so glad you got round to using your red ribbon! wow i love your image it is so cute!!! Hi Heide thank you for taking the time to join our challenge you have made a very cute card and the red ribbon goes great with the design. Very cute card. Love the stamp.